This ought to tide you over until the seventh season of Game of Thrones starts. 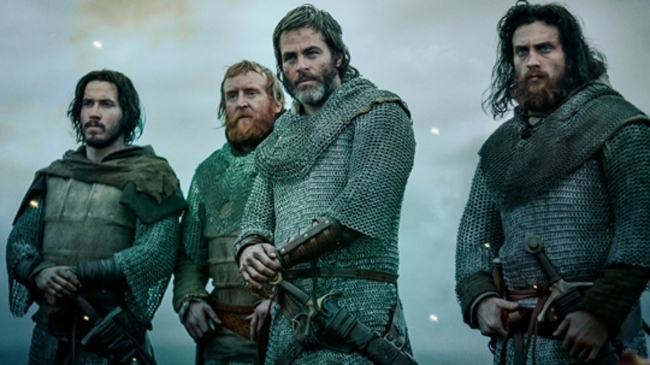 Of all the shows and movies coming to Netflix in November, Chris Pine's Scottish historical epic, Outlaw King, is the one that needs to be on your watchlist. Even if it's just to marvel at the fact that Netflix, the quirky video-rental-by-mail company, has somehow managed to produce a movie budgeted at $130 million that stars Captain Kirk and nobody has batted an eye. Outlaw King tells the story of Robert the Bruce (you may remember him from Braveheart), the King of Scots, during the First War of Scottish Independence. The film was directed by David Mackenzie, who also directed Hell or High Water, one of our all-time favorite movies that just so happens to star Chris Pine, too. One thing you may have noticed from the above trailer is that Pine doesn't hold back with his Scottish accent, which is not an easy accent to master by the way. And aside from Chris Pine, there's really not much in the way of big names in the cast, and that could either help or hinder the movie. Guess we'll find out! At this point, all we have to go on are the trailers -- and, if you ask us, the trailers look awesome! If this movie is, as the trailers suggest, Game of Thrones meets Hell or High Water, we'll spontaneously combust. Outlaw King will be released on Netflix November 9. What do you think? Will you be watching Outlaw King once it's released on Netflix? Let us know your thoughts in the comments below.